Two years ago a 32 years old architect Oliver Beardon left his job to start a unique interdisciplinary sailing project – Sail Britain. Today this project is successfully exploring the British coastline through research, the creative arts and engagement with communities. It helps people reconnect with maritime culture, identity as well as better appreciate the beauty and importance of its environment. „When you talk to most people about adventure sailing, far-away destinations, exotic places and dramatic landscapes come to mind. But the more I have sailed around the British Isles, the more I have realised that this small collection of islands offers world-class adventure. Yet most of us who live here don’t realize, choosing rather seek adventure on the far side of the world. It was this growing realisation, and my own dream to sail around the UK, which led me to start Sail Britain in 2015. 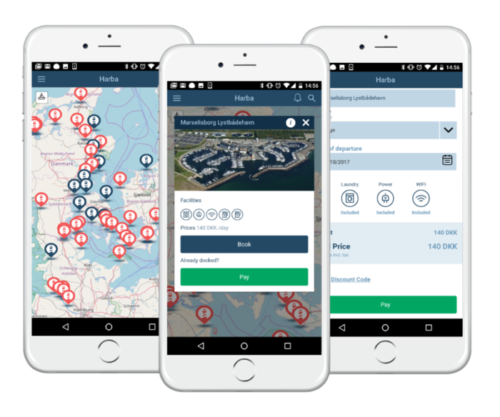 With over 100 inhabited islands and over 10,000 miles of coastline, there is much to explore, as well as an ancient seafaring history and culture. However, I did not want to make the journey alone. Learning to sail and facing the elements is a wonderful way of bringing people together. I felt that this voyage had so much potential as a collaborative project. We are losing the touch with the sea and its importance for our culture and our future. The ocean is facing some serious environmental challenges such as plastic pollution and over-fishing. Certainly, the opportunities for this voyage seemed too good to miss. 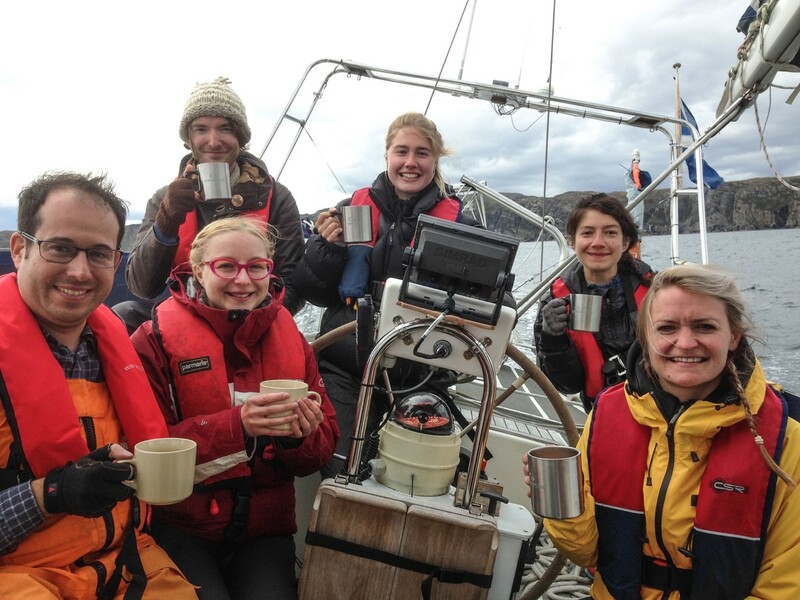 Through our sailing programmes, Sail Britain engages people from many different backgrounds with the sea, each other, and the importance of our marine environment. We sail with artists, musicians, scientists, researchers, storytellers and people from all walks of life. I’m a strong believer in the value of interdisciplinary working; everyone has something to bring to the table. 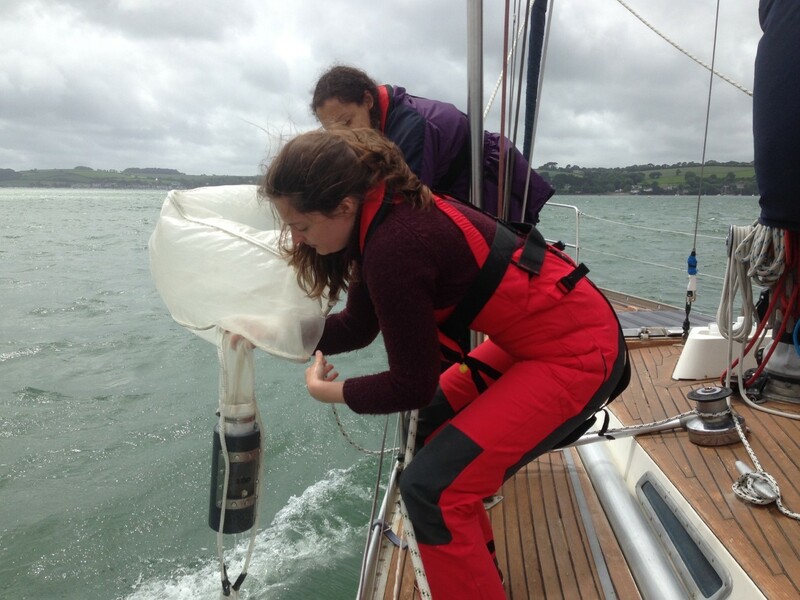 In June we chartered a Swan 38 and set sail from Falmouth on a microplastics research expedition. We wanted to sample the wonderful rivers of Cornwall with a scientific team from Exeter University’s Marine Biology department. Microplastic pollution is one of the greatest challenges facing the ocean and the vast majority originates from land-based sources. So, our water samples were taken from many areas to get a picture of the concentration and distribution of particles. Our first day dawned bright. The turquoise sea sparkled in the sunshine as we stormed out of Carrick Roads at over 8 knots into a fresh southwesterly breeze. 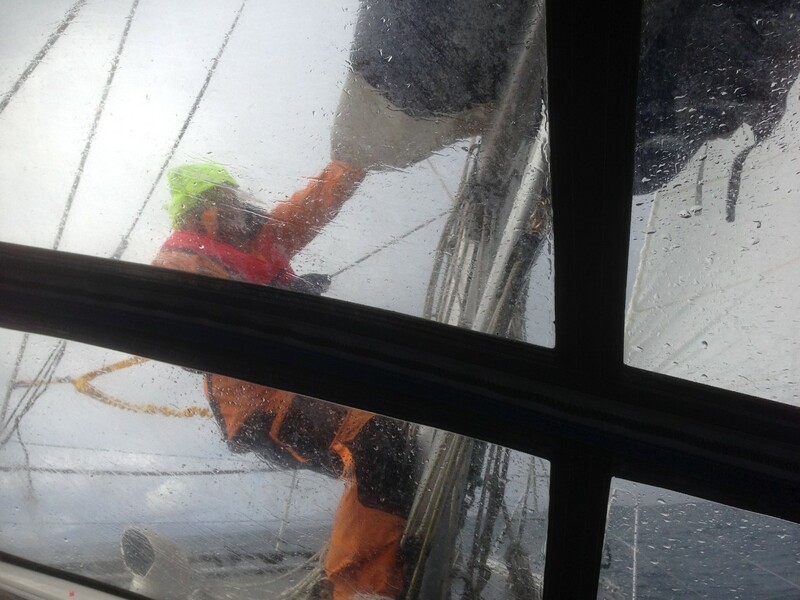 The team spent the first few days just learning to sail and getting to know each other, which is vital for any expedition, and also learning about life aboard. We also had an artist in residence in the crew. She was working alongside the research team giving creative ideas which added a valuable dimension to the scientific research. Her work will help us to spread the environmental message to a wider audience. The creative arts are a wonderful way of exploring new places and it goes very well with the activity and beauty of sailing. 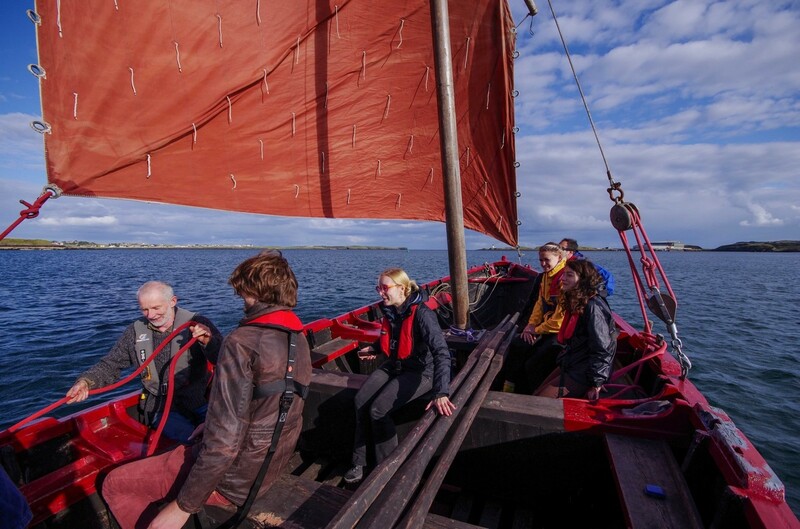 In August Sail Britain worked with the An Lanntair arts centre in Stornoway, Isle of Lewis, to offer an expedition for five artists to explore the cultural heritage of the Outer Hebrides, the string of islands in the far north west of Scotland facing the Atlantic. The culture here is so strongly connected with the sea that exploring under sail seemed the only way to go. Before leaving Stornoway, we were very lucky to have the opportunity to sail a traditional Hebridean Sgoth, a lug sailed boat closely related to Viking ships, though for this trip our boat was a Westerly Oceanlord 41, a very solid, seaworthy yacht. And we needed it! The wind between the islands soon rose to a Force 7 as we stormed upwind towards the shelter of Lochmaddy on the island of North Uist. It was a challenging introduction for our novice crew to the power of the ocean! The gale passed after a day or two however and we were able to explore some of the hidden gems of this coastline. 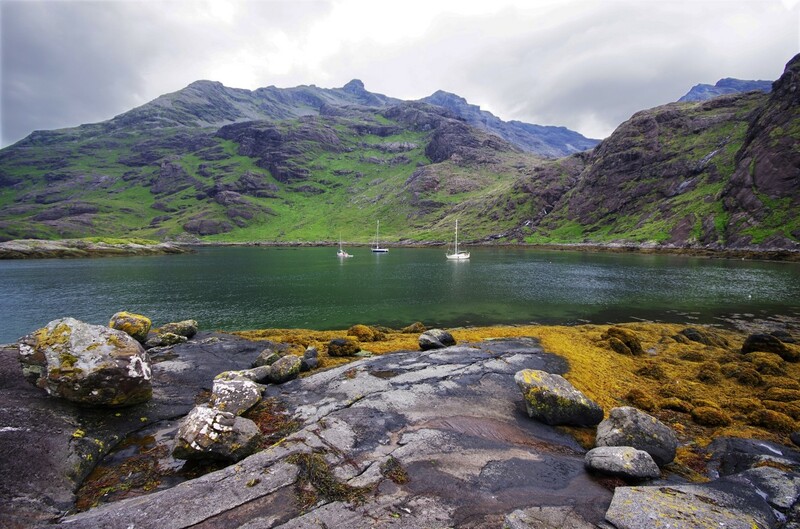 Highlights were the stunning Shiant Isles and the many sea lochs which reach their fingers in amongst the mountains. 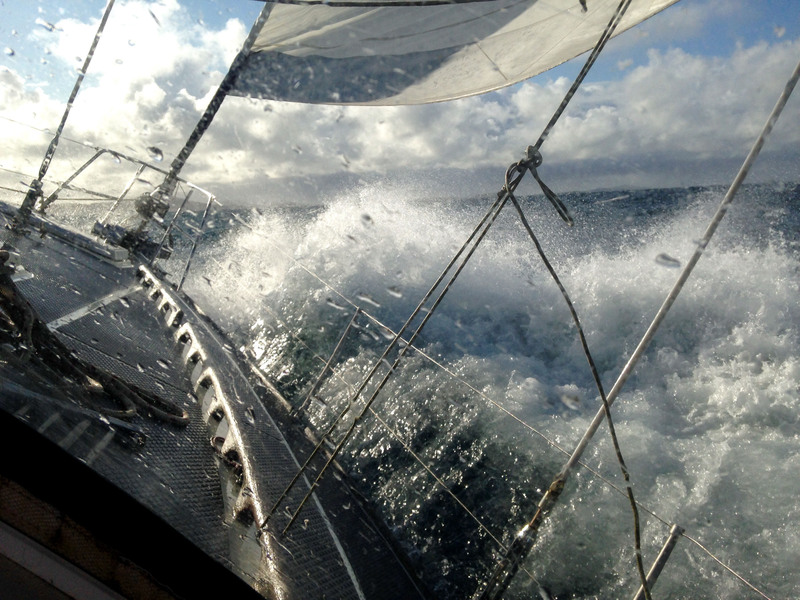 Sailing in Scotland can be wild and challenging, but the rewards are wonderful. Where else can you see three pairs of golden eagles in one afternoon, and be surrounded by diving gannets piercing your wake like arrows? And of course the dolphins, our favourite companion. Sail Britain has been an incredible journey so far, and the places we have explored and the ideas which have come out of our research so far have been truly special, both for the project and for me personally. There are many challenges ahead though. Perhaps the biggest is being able to afford an expedition vessel of our own on which to continue the journey. We are looking for a seaworthy, 10 berth yacht to join the project, so if any readers have some ideas, we’re always very happy to hear from you! You can follow Sail Britain adventures via the website, www.sailbritain.org, as well as via their social media profiles – Instagram, Facebook and Twitter.